We conducted velocity testing to help our customers answer the seemingly hardest question when it comes to ordering a new custom barrel: What length? With the velocity testing data we’ve collected, making that decision is easier than ever. Now our customers can know how much, if any, difference there is at a specific length. We built six of our most demanded Encore barrels at 27″ (our maximum barrel length), then we tested and recorded the velocity. 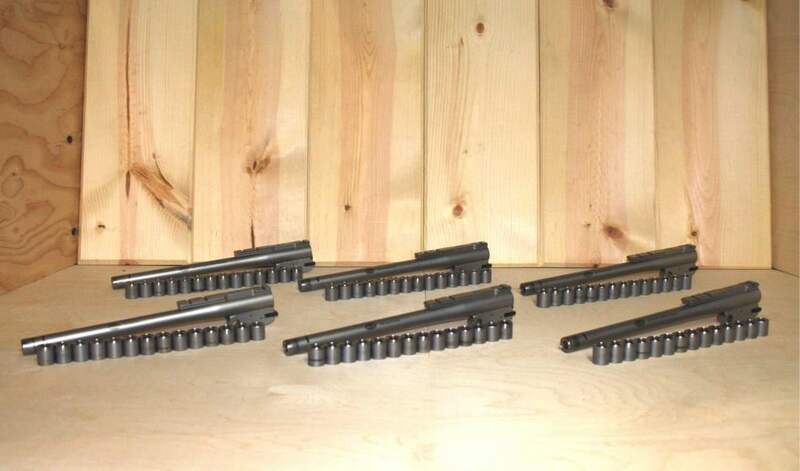 The barrels are: 6.5mm Creedmoor, 280 Remington Ackley Improved, 444 Marlin, 450 Bushmaster, 460 Smith & Wesson Magnum, and the 45-70 Government. 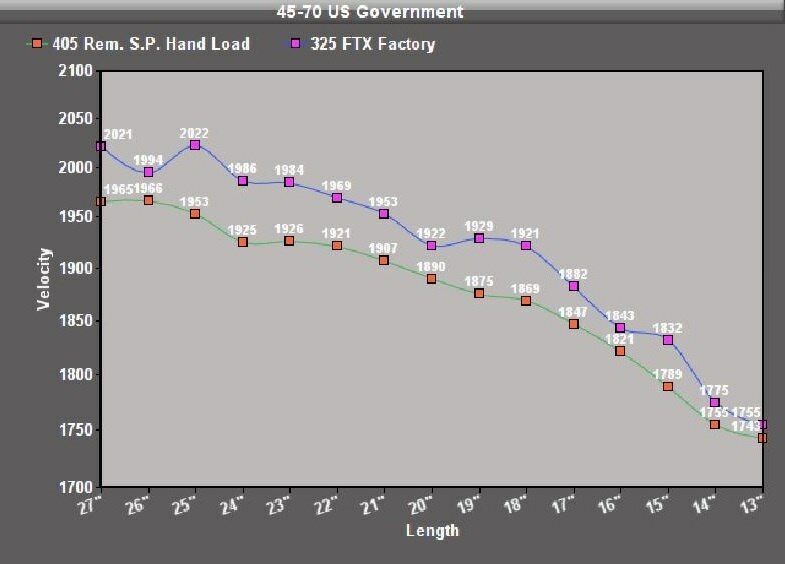 We then cut an inch off each barrel and retested again, repeating the process 14 times, ending at 13″. The ammunition we selected for the tests were a combination of popular factory loaded average weight bullets, to the heavier-than-standard hand loads. We wanted to cover the most sought-after bullet weights for the caliber so our testing was as relevant as possible to anyone. All of the barrel cleaning and shortening was done here at Match Grade Machine. The hand loads were put together by Steve’s Custom Guns, a local enthusiast. Steve also performs all of the load data for customers who don’t want to take the time to tune loads to their barrels or if they are experiencing difficulties with their own setup. We have to commend Steve for his thorough data collection and willingness to spend the time to painstakingly shoot six barrels, then shorten and repeat. For practical reasons people are going with shorter barrels because 50-100 fps isn’t that much of a difference for cartridges and their distance capabilities. Due to many reasons, shorter barrels are easier to tune and handle, therefore have greater accuracy potential. 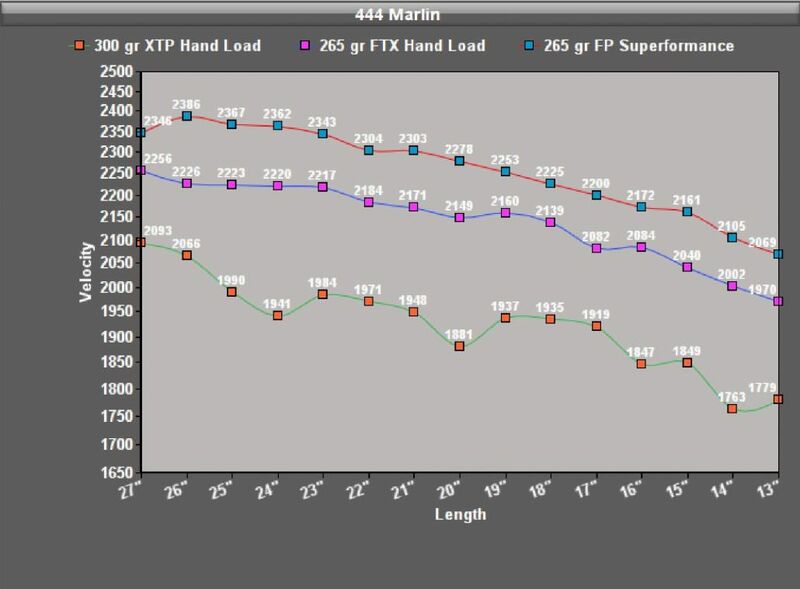 Take a look at the first velocity testing results we have compiled and see for yourself how length affects performance on firearms. The information below is for informational purposes only and is provided only to help you determine which barrel best suits you. This is not meant to be instructive of the loads you should actually use, and you should not rely on the load information below in loading your own rounds. Hand-loading ammunition can be dangerous if done improperly, and mistakes may result in serious injury or death. Always use a reputable reloading manual to source information on selecting loads for your firearm. Match Grade Machine is not responsible for any mishap caused by negligent or otherwise improper hand-loading of cartridges. Be sure to always use the proper equipment, tools, and safety measures when reloading, shooting, transporting, and cleaning your firearms. Know your firearm’s capabilities and operation procedures before use. Click the button below to auto scroll to selected cartridge. The 6.5mm Creedmoor has been one of, if not the most, desired barrels we build for the Encore. The combination of light recoil, and excellent trajectory, mixed with the versatility to be chambered in short action rifles, semi-autos, and of course the T/C Encore, has led many folks to make this their cartridge of choice. Being a 6.5mm, the bullet selection varies from ultra-light varminting bullets, all the way up to the heavies with ballistic coefficients in the .6’s. We tested three different weights for this cartridge in our velocity testing, and we were quite impressed with the results. No matter what shooting style is chosen, it’s best to know the velocity range at a length before purchasing. 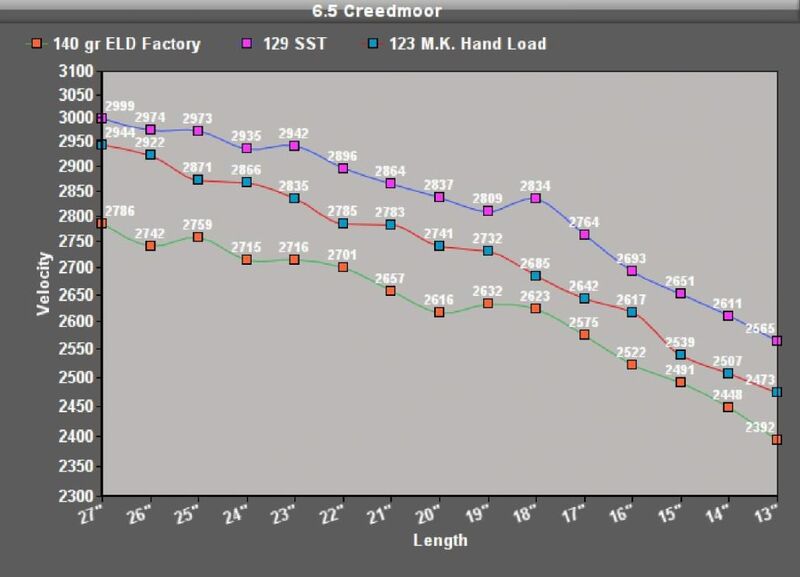 As you can see, length on the 6.5mm Creedmoor is a factor that affects performance, so make sure to research your application and make your decision wisely. When we were trying to decide which magnum/very high power cartridge to go with for the testing, we all agreed that the 280 Remington Ackley Improved deserved the spot. There are similar velocity tests for 300 Winchester Magnums already published, so we didn’t want to repeat that info. The thought behind this cartridge was getting the fastest 7mm bullet with a .473″ diameter case head. This enabled gunsmiths to take the ‘ol 30-06 or 270 Winchester and make it a serious performance hunting rifle. That being said, looking at the results from the testing, giving the bullet every last inch within reason is the way to go with this round. Maximum practical length for the application. During this velocity test, it was very obvious this cartridge was Steve’s favorite barrel of the lot. He stated, “That 444 Marlin is a sweetheart of a round. It has earned my trust.” Being an excelling hunting cartridge, shots past 375 yards are no problem if the drop is properly calculated. 23″ seems like a good length for both standard weight as well as the heavies. The 450 Bushmaster was developed for use in AR-15 rifles. The parent case is a modified 284 Winchester, it’s simply cut to 1.695″ and also utilizes a small rifle primer. As soon as the cartridge’s proprietary status was lifted we ordered a reamer and started building barrels. The prototype barrel we built was 24″ with and integral brake drilled out front. This barrel produced excellent accuracy at not only closer ranges, but we were able to consistently hit a 12″ target at 475 yards with a 2-7 power scope! 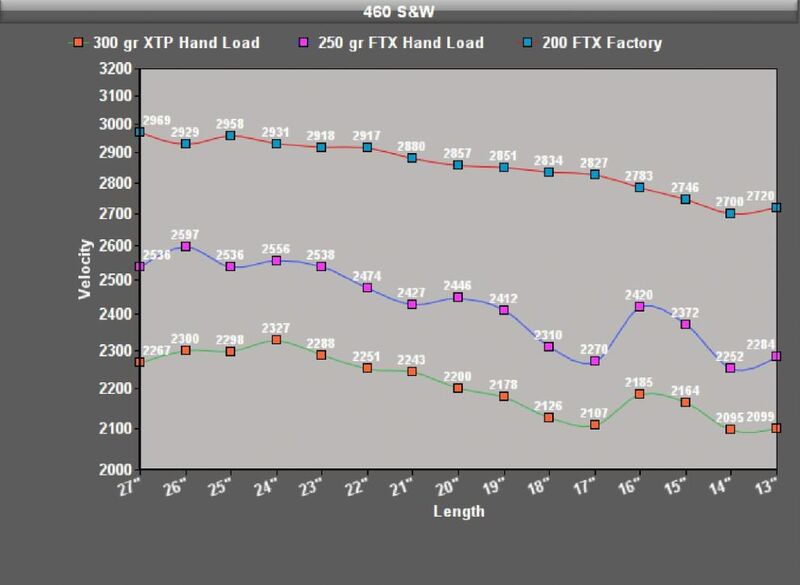 All of the initial testing was done with Hornady 250 gr FTX ammo, the only ammo available at the time. Not only is it a freight train of a round, but with tack-driving accuracy, this is the whitetail smoking choice we’ve been recommending instead of the 460 S&W Mag since our testing. 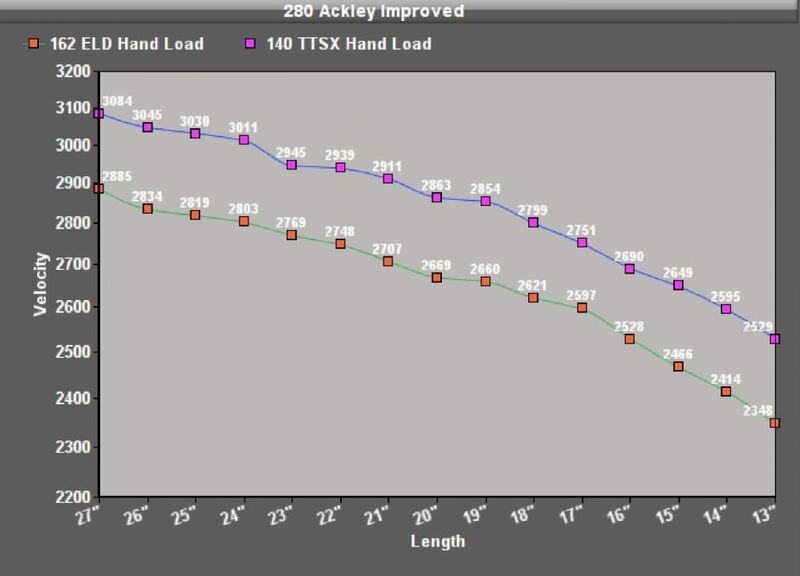 Both loads we tested had the least amount of velocity lost from cutting the barrels down! This means go as short as needed without any worry of hindering performance. Velocity range: 2,380-2,177 fps, a 203 fps spread! Velocity range: 2,091-1,917 fps, a 174 fps spread! 19″ will give the gusto! 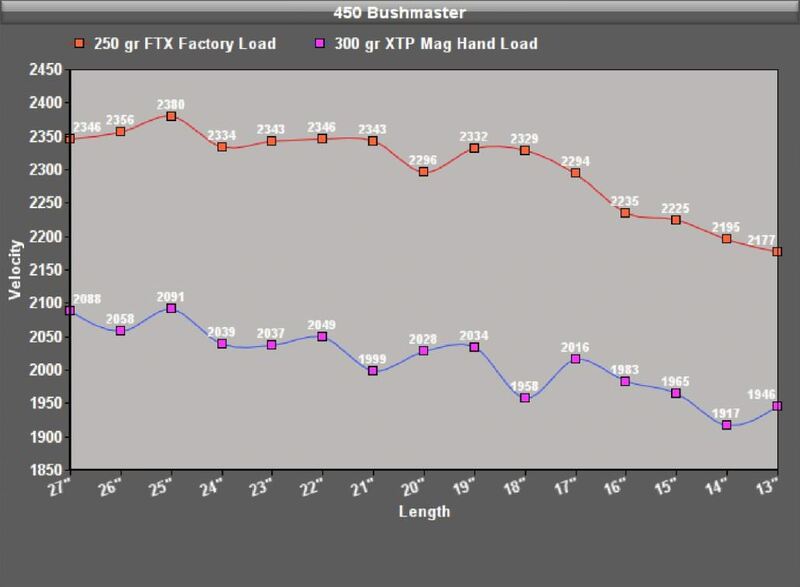 At 2330 fps the 250 gr FTX carries over 3,000 ft/lbs of energy! We have only one thing to say about the 460 S&W… It’s fast. Maybe even too fast though. We’ve had countless barrels shipped back with accuracy problems, but the problem has nothing to do with the barrels. The problem is the weak mounting system that was not one of our steel, six hole mounts. The aluminum options from anywhere else are simply inadequate for the recoil of this round. Upon the inspection of a returned barrel, often times the rings had moved forward to the point that the recoil lug side of the slots were completely smashed in, which means the scope was moving with every shot. Like we’ve done since the 450 Bushmaster was added to our list of available chambers, we highly recommend the 450 Bushmaster over the 460 Smith & Wesson every time we are asked. ABSOLUTE MUST! Get our steel mount system, preferably the picatinny style. Brake it. Get a muzzle brake to tame this monster. Hand-load with the 250 FTX and start mild. There’s very little, if any data to load with this bullet, but it’s a far superior choice over the 200 grain factory ammo. Unexplainable (vertical) inconsistent groups and matching spreads in velocity. 24″- The only reason to buy the 460 S&W over the 450 BM would be speed, for this reason you’d need 24″ to get almost all of what this bad boy will give. The classic 45-70 Government has a well known reputation for being an excellent hunting cartridge due to it’s big and heavy projectiles.